Most Americans are under the impression that compulsory water fluoridation is a safe and effective public health measure to fight tooth decay, and courts have routinely upheld compulsory water fluoridation schemes as legitimate exercises of police power to ensure the dental health of communities. Yet the evidence is steadily mounting against water fluoridation, with recent scientific studies suggesting that not only is fluoridation not effective at achieving the stated public health goal of combating dental caries, but also that excess exposure to fluoride contributes to a host of far more serious health concerns, particularly in the very population the public health measure was originally alleged to benefit -- children. With growing evidence suggesting that systemic intake of excess fluoride is linked to dental and skeletal fluorosis, endocrine disruption, hypothyroidism, bone cancer, and lowered IQ’s in children, it is perhaps not surprising that hundreds of U.S. and Canadian cities and towns are now opting to either reject or cease fluoridating their water supplies, joining over 97% of Europe and most of the developed world in rejecting compulsory water fluoridation. In 2011, in light of new scientific evidence as well as the recommendation by the National Research Council (“NRC”), the Environmental Protection Agency (“EPA”) announced its intention to re-examine its currently allowed Maximum Contaminant Levels (MCL) of fluoride in drinking water. EPA’s decision was based on the 2006 NRC report recommending that EPA lower its allowable fluoride levels, in part due to the numerous studies linking serious health problems with excess exposure to fluoride, as well as concern over the significant “gaps in research” establishing the safety of systemic fluoride intake. Shortly after EPA made its own announcement, the Department of Health and Human Services recommended that community water districts lower their allowable fluoride levels to .7 ppm, the lowest level in a range earlier recommended by DHHS. This change sprang from DHHS’s recognition that original “optimal” fluoride levels were set without considering human fluoride consumption from other products, including fluoridated toothpaste and food and beverages made with fluoridated water. Although the EPA to date has not yet come out with any revised Maximum Contaminant Levels for fluoride, this article is first to suggest that, in light of the mounting scientific evidence and ongoing federal agency reconsideration of safe fluoride levels in drinking water, compulsory water fluoridation must now be reassessed to determine whether it remains both legally and ethically justifiable as a coercive public health measure. Specifically, this article analyzes whether compulsory water fluoridation can withstand systematic scrutiny of its risks, benefits, human rights burden and economic costs, or whether the significant gaps in research suggest that compulsory water fluoridation is more properly viewed as human subjects experimental research, requiring the application of strict informed consent and vulnerable population control protocols. 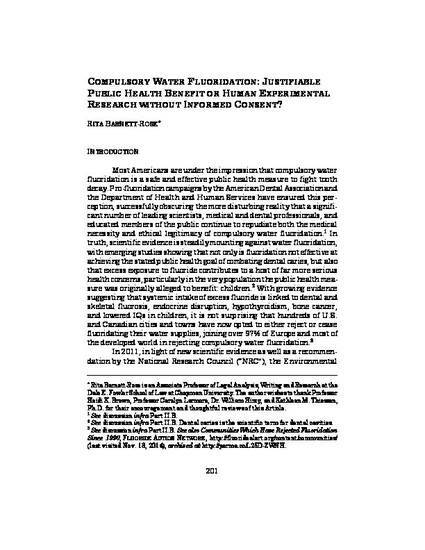 Rita Barnett-Rose, Compulsory Water Fluoridation: Justifiable Public Health Benefit or Human Experimental Research Without Informed Consent?, 39 Wm. & Mary Envtl. L. & Pol'y Rev. 201 (2014).